Asteroid impact prediction is the prediction of the dates and times of asteroids impacting Earth, along with the locations and severities of the impacts. Discovery of an asteroid and initial assessment of its orbit which generally includes a short observation arc of less than 14 days. Calculating if, when and where the orbit may intersect with Earth at some point in the future. In addition, although not strictly part of the prediction process, once an impact has been predicted, an appropriate response needs to be made. Most asteroids are discovered by a camera on a telescope with a wide field of view. Image differencing software compares a recent photograph with earlier ones of the same part of the sky, detecting objects that have moved, brightened, or appeared. Follow up can be carried out by any telescope powerful enough to see the newly detected object. Orbit intersection calculations are then carried out by two independent systems, one (Sentry) run by NASA and the other (NEODyS) by ESA. A few near misses have been predicted, years in advance, with a tiny chance of actually striking Earth. A handful of actual impactors have been detected hours in advance. They were small, struck wilderness or ocean, and hurt nobody. Current systems only detect an arriving object when several factors are just right, mainly the direction of approach, weather, and phase of the Moon. The result is a low rate of success. Performance is improving as existing systems are upgraded and new ones come on line, but some of the issues the current systems face can only be overcome by a dedicated space based system. In 1992 a report to NASA recommended a coordinated survey (christened Spaceguard) to discover, verify and provide follow-up observations for Earth-crossing asteroids. This survey was scaled to discover 90% of all objects larger than one kilometer within 25 years. Three years later, a further NASA report recommended search surveys that would discover 60–70% of the short-period, near-Earth objects larger than one kilometer within ten years and obtain 90% completeness within five more years. In 1998, NASA formally embraced the goal of finding and cataloging, by 2008, 90% of all near-Earth objects (NEOs) with diameters of 1 km or larger that could represent a collision risk to Earth. The 1 km diameter metric was chosen after considerable study indicated that an impact of an object smaller than 1 km could cause significant local or regional damage but is unlikely to cause a worldwide catastrophe. The impact of an object much larger than 1 km diameter could well result in worldwide damage up to, and potentially including, extinction of the human race. The NASA commitment has resulted in the funding of a number of NEO search efforts, which made considerable progress toward the 90% goal by the target date of 2008 and also produced the first ever successful prediction of an asteroid impact (the 4-meter 2008 TC3 was detected 19 hours before impact). However the 2009 discovery of several NEOs approximately 2 to 3 kilometers in diameter (e.g. 2009 CR2, 2009 HC82, 2009 KJ, 2009 MS and 2009 OG) demonstrated there were still large objects to be detected. Three years later, in 2012, the small asteroid 367943 Duende was discovered and successfully predicted to be on close but non-colliding approach to Earth again just 11 months later. This was a landmark prediction as the object was only 20 m × 40 m, and it was closely monitored as a result. On the day of its closest approach and by coincidence, a smaller asteroid was also approaching Earth, unpredicted and undetected, from a direction close to the Sun. Unlike 367943 Duende it was on a collision course and it impacted Earth 16 hours before 367943 Duende passed, becoming the Chelyabinsk meteor. It injured 1,500 people and damaged over 7,000 buildings, raising the profile of the dangers of even small asteroid impacts if they occur over populated areas. The asteroid is estimated to have been 17 m across. In April 2018, the B612 Foundation stated "It's 100 per cent certain we'll be hit [by a devastating asteroid], but we're not 100 per cent sure when." Also in 2018, physicist Stephen Hawking, in his final book Brief Answers to the Big Questions, considered an asteroid collision to be the biggest threat to the planet. In June 2018, the US National Science and Technology Council warned that America is unprepared for an asteroid impact event, and has developed and released the "National Near-Earth Object Preparedness Strategy Action Plan" to better prepare. The first step in predicting impacts is detecting asteroids and determining their orbits. Finding faint Near-Earth objects against the background stars is very much a needle in a haystack search. It is achieved by sky surveys that are designed to discover near Earth asteroids. Unlike the majority of telescopes that have a narrow field of view and high magnification, survey telescopes have a wide field of view to scan the entire sky in a reasonable amount of time with enough sensitivity to pick up the faint Near-Earth objects they are searching for. NEO focused surveys revisit the same area of sky several times in succession. Movement can then be detected using image differencing techniques. Anything that moves from image to image against the background of stars is compared to a catalogue of all known objects, and if it is not already known is reported as a new discovery along with its precise position and the observation time. This then allows other observers to confirm and add to the data about the newly discovered object. The existing asteroid surveys have a fairly clear-cut division between 'cataloging surveys' which use larger telescopes to mostly identify larger asteroids well before they come very close to Earth, and 'warning surveys' which use smaller telescopes to mostly look for smaller asteroids on their final approach. Cataloging systems focus on finding larger asteroids years in advance and they scan the sky slowly (of the order of once per month), but deeply. Warning systems focus on scanning the sky relatively quickly (of the order of once per night) and typically cannot detect objects that are as faint as cataloging systems. Some systems compromise and scan the sky say once per week. Smaller near-Earth objects are far more numerous (millions) and therefore impact Earth much more often, and the vast majority remain undiscovered. They seldom pass close enough to Earth on a previous approach that they become bright enough to observe, and so most can only be observed on final approach. They therefore cannot usually be cataloged well in advance and can only be warned about, a few weeks to days in advance. This is much too late to deflect them away from Earth, but is enough time to mitigate the consequences of the impact by evacuating and otherwise preparing the affected area. Current mechanisms for detecting asteroids on final approach rely on ground based telescopes with wide fields of view. Those currently can monitor the sky at most every second night, and therefore miss most of the smaller asteroids which are bright enough to detect for less than two days. 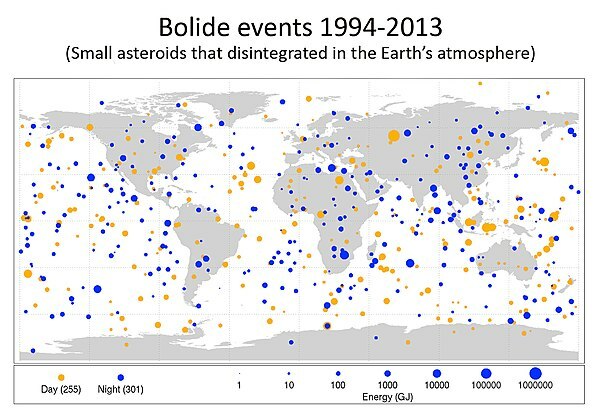 Small asteroids much more commonly impact Earth than larger ones, but make very little damage. Much more importantly, ground-based telescopes cannot detect most of the asteroids which impact the day side of the planet. These and other problems mean very few impacts are successfully predicted (see §Effectiveness of the current system and §Improving impact prediction). The main NEO focussed surveys are listed below, along with future telescopes that are already funded. They have a fairly clear-cut division between 'cataloging surveys' and 'warning surveys'. The existing warning surveys have enough capacity between them to scan the northern sky once per clear night. However, they are concentrated in a relatively small part of the planet. Two surveys (Pan-STARRS and ATLAS) are in Hawaii, which means they see the same parts of the sky at the same time of day, and are affected by the same weather. Two others (Catalina Sky Survey and Zwicky Transient Facility) are located in the southwestern United States and so suffer from similar overlap. These surveys do complement each other to an extent in that some are cataloging surveys and some are warning surveys. However, the resulting coverage across the globe is imperfect. In particular, there are currently no major surveys in the Southern Hemisphere. This coverage limitation is most relevant for warning surveys, since cataloging surveys also have opportunities to detect asteroids when their orbit brings them to the Northern sky. This clustering together of the sky surveys in the Northern hemisphere means that around 15% of the sky at extreme Southern declination is never monitored, and that the rest of the Southern sky is observed over a shorter season than the Northern sky. Moreover, as the hours of darkness are fewer in summertime, the lack of a balance of surveys between North and South means that the sky is scanned less often in the Northern summer. Once it is completed, the Large Synoptic Survey Telescope will cover the southern sky, but being at a similar longitude to the other surveys there will still be times every day when it will be in daylight along with all the others. The 3.5 m Space Surveillance Telescope, which was originally also in the southwest United States, was dismantled and moved to Western Australia in 2017. When completed, this would make a significant difference to the global coverage. However, due to the new site being in a cyclone region, construction has not been completed. Unless this issue is resolved, the two new ATLAS telescopes planned for construction in the Southern hemisphere (including one at the South African Astronomical Observatory) by 2020, are currently the only ones which will cover this gap in monitoring the skies (south east of the globe). ATLAS, the "Asteroid Terrestrial-impact Last Alert System" uses two 0.5 metre telescopes located at Haleakala and Mauna Loa on two of the Hawaiian Islands. With a field of view of 30 square degrees each, the telescopes survey the observable sky down to apparent magnitude 19 with 4 exposures every two clear nights. The survey has been fully operational with these two telescopes since 2017, and in 2018 obtained NASA funding for two additional telescopes. Both will be sited in the Southern hemisphere, with one at the South African Astronomical Observatory, and they are expected to take 18 months to build. Their southern locations will provide coverage of the 15% of the sky that cannot be observed from Hawaii, and the doubling of its observing resources will allow ATLAS to survey the observable sky with 4 exposures every clear night rather than every two nights. In 1998, the Catalina Sky Survey (CSS) took over from Spacewatch in surveying the sky for the University of Arizona. It uses two telescopes, a 1.5 m Cassegrain reflector telescope on the peak of Mount Lemmon (also known as a survey in its own right, the Mount Lemmon Survey), and a 0.7 m Schmidt telescope near Mount Bigelow (both in the Tucson, Arizona area in the south west of the United States). Both sites use identical cameras which provide a field of view of 5 square degrees on the 1.5-m telescope and 19 square degrees on the Catalina Schmidt. The Cassegrain reflector telescope takes three to four weeks to survey the entire sky, detecting objects fainter than apparent magnitude 21.5. The 0.7 m telescope takes a week to complete a survey of the sky, detecting objects fainter than apparent magnitude 19. This combination of telescopes, one slow and one medium, has so far detected more near Earth Objects than any other single survey. This shows the need for a combination of different types of telescopes. CSS used to include a telescope in the Southern Hemisphere, the Siding Spring Survey. However operations ended in 2013 after funding was discontinued. The Large Synoptic Survey Telescope (LSST) is a wide-field survey reflecting telescope with an 8.4-meter primary mirror, currently under construction on Cerro Pachón in Chile. It will survey the entire available sky around every three nights. Science operations are due to begin in 2022. Scanning the sky relatively fast but also being able to detect objects down to apparent magnitude 27, it should be good at detecting nearby fast moving objects as well as excellent for larger slower objects that are currently further away. The Near Earth Object Survery TELescope (NEOSTEL) is an ESA funded project, starting with an initial prototype currently under construction. The telescope is of a new "fly-eye" design that combines a single reflector with multiple sets of optics and CCDs, giving a very wide field of view (around 45 square degrees). When complete it will have the widest field of view of any telescope and will be able to survey the majority of the visible sky in a single night. If the initial prototype is successful, three more telescopes are planned for installation around the globe. Because of the novel design, the size of the primary mirror is not directly comparable to more conventional telescopes, but is equivalent to a conventional 1 metre telescope. The telescope itself should be complete by end of 2019, and installation on Mount Mufara, Sicily should be complete in 2020. Viewed from space by WISE using a thermal camera, asteroid 2010 AB78 appears redder than the background stars as it emits most of its light at longer infrared wavelengths. In visible light it is very faint and difficult to see. The Wide-field Infrared Survey Explorer is a 0.4 m infrared-wavelength space telescope launched in December 2009, and placed in hibernation in February 2011. It was re-activated in 2013 specifically to search for near-Earth objects under the NEOWISE mission. By this stage, the spacecraft's cryogenic coolant had been depleted and so only two of the spacecraft's four sensors could be used. Whilst this has still led to new discoveries of asteroids not previously seen from ground-based telescopes, the productivity has dropped significantly. In its peak year when all four sensors were operational, WISE made 2.28 million asteroid observations. In recent years, with no cryogen, NEOWISE typically makes approximately 0.15 million asteroid observations annually. The next generation of infrared space telescopes has been designed so that they do not need cryogenic cooling. Pan-STARRS, the "Panoramic Survey Telescope And Rapid Response System", currently (2018) consists of two 1.8 m Ritchey–Chrétien telescopes located at Haleakala in Hawaii. It has discovered a large number of new asteroids, comets, variable stars, supernovae and other celestial objects. Its primary mission is now to detect mear-Earth objects that threaten impact events, and it is expected to create a database of all objects visible from Hawaii (three-quarters of the entire sky) down to apparent magnitude 24. The Pan-STARRS NEO survey searches all the sky north of declination −47.5. It takes three to four weeks to survey the entire sky. The Space Surveillance Telescope (SST) is a 3.5 m telescope that detects, tracks, and can discern small, obscure objects, in deep space with a wide field of view system. The SST mount uses an advanced servo-control technology, that makes it one of the quickest and most agile telescopes of its size. It has a field of view of 6 square degrees and can scan the visible sky in 6 clear nights down to apparent magnitude 20.5. Its primary mission is tracking orbital debris. This task is similar to that of spotting near-Earth asteroids and so it is capable of both. The SST was initially deployed for testing and evaluation at the White Sands Missile Range in New Mexico. On December 6, 2013, it was announced that the telescope system would be moved to the Naval Communication Station Harold E. Holt in Exmouth, Western Australia. The SST was moved to Australia in 2017, but due to the new site being in a cyclone region, construction has been delayed, pending a redesign that can withstand cyclone force winds. Spacewatch was an early sky survey focussed on finding near Earth asteroids, originally founded in 1980. It was the first to use CCD image sensors to search for them, and the first to develop software to detect moving objects automatically in real-time. This led to a huge increase in productivity. Before 1990 a few hundred observations were made each year. After automation, annual productivity jumped by a factor of 100 leading to tens of thousands of observations per year. This paved the way for the surveys we have today. Although the survey is still in operation, in 1998 is was superseded by Catalina Sky Survey. Since then it has focused on following up on discoveries by other surveys, rather than making new discoveries itself. In particular it aims to prevent high priority PHOs from being lost after their discovery. The survey telescopes are 1.8 m and 0.9 m. The two follow up telescopes are 2.3 m and 4 m.
The Zwicky Transient Facility (ZTF) was commissioned in 2018, superseding the Intermediate Palomar Transient Factory (2009–2017). It is designed to detect transient objects that rapidly change in brightness as well as moving objects, for example supernovae, gamma ray bursts, collisions between two neutron stars, comets and asteroids. The ZTF is a 1.2 m telescope that has a field of view of 47 square degrees, designed to image the entire northern sky in three nights and scan the plane of the Milky Way twice each night to a limiting magnitude of 20.5. The amount of data produced by ZTF is expected to be 10 times larger than its predecessor. Once a new asteroid has been discovered and reported, other observers can confirm the finding and help define the orbit of the newly discovered object. The International Astronomical Union Minor Planet Center (MPC) acts as the global clearing house for information on asteroid orbits. It publishes lists of new discoveries that need verifying and have still uncertain orbits, and it accepts the resulting follow up observations from around the world. Unlike the initial discovery, which typically requires unusual and expensive wide-field telescopes, ordinary telescopes can be used to confirm the object as its position is now approximately known. There are far more of these around the globe, and even a well equipped amateur astronomer can contribute valuable follow-up observations of moderately bright asteroids. For example, the Great Shefford Observatory in the back garden of amateur Peter Birtwhistle typically submits thousands of observations to the Minor Planet Center every year. Nonetheless, some surveys (for example CSS and Spacewatch) have their own dedicated follow up telescopes. for imminent impacts it helps to make a better prediction of where the impact will occur and whether there is any danger of hitting a populated area. for asteroids that will miss Earth this time round, the more accurate the orbit model is, the further into the future its position can be predicted. This allows recovery of the asteroid on its subsequent approaches, and impacts to be predicted years in advance. Assessing the size of the asteroid is important for predicting the severity of the impact, and therefore the actions that need to be taken (if any). With just observations of reflected visible light by a conventional telescope, the object could be anything from 50% to 200% of the estimated diameter, and therefore anything from one eighth to eight times of the estimated volume and mass. Because of this, one key follow up observation is to measure the asteroid in the thermal infrared spectrum (long-wavelength infrared), using an infrared telescope. The amount of thermal radiation given off by an asteroid together with the amount of reflected light allows a much more accurate assessment of its size than just how bright it appears in the visible spectrum. Jointly using thermal infrared and visible measurements, it is possible to estimate the size to within about 10% of the true size. One example of a such a follow up observation was for 3671 Dionysus by UKIRT, the worlds largest infrared telescope at the time (1997). However such follow ups are rare. The size estimates of most near-Earth asteroids are based on visible light only. If the object was discovered by an infrared survey telescope initially, then an accurate size estimate will already be available, and infrared follow up will not be needed. However none of the ground-based survey telescopes listed above operate at thermal infrared wavelengths. The NEOWISE satellite had two thermal infrared sensors but they stopped working when the cryogen ran out. There are therefore currently no active or planned thermal infrared sky surveys which are focused on discovering near-Earth objects. The minimum orbit intersection distance (MOID) between an asteroid and the Earth is the distance between the closest points of their orbits. This first check is a coarse measure that does not allow an impact prediction to be made, but is based solely on the orbit parameters and gives an initial measure of how close to Earth the asteroid could come. If the MOID is large then the two objects never come near each other. In this case, unless the orbit of the asteroid is perturbed so that the MOID is reduced at some point in the future, it will never impact Earth and can be ignored. However if the MOID is small then it is necessary to carry out more detailed calculations to determine if an impact will happen in the future. NASA considers asteroids with a MOID of less than 0.05 AU and an absolute magnitude brighter than 22 to be a potentially hazardous asteroid. Orbit and positions of 2018 LA and Earth, 30 days before impact. The diagram shows how orbit data can be used to predict impacts well in advance. This particular asteroid's orbit was only known a few hours before impact. The diagram was made later. Once the initial orbit is known, the potential positions can be forecast years into the future and compared to the future position of Earth. If the distance between the asteroid and the centre of the Earth is less than Earth radius then a potential impact is predicted. To take account of the uncertainties in the orbit of the asteroid, several future projections are made (simulations). Each simulation has slightly different parameters within the range of the uncertainty. This allows a percentage chance of impact to be estimated. For example, if 1,000 simulations are carried out and 73 result in an impact, then the prediction would be a 7.3% chance of impact. NEODyS (Near Earth Objects Dynamic Site) is a European Space Agency service that provides information on near Earth objects. It is based on a continually and (almost) automatically maintained database of near earth asteroid orbits. The site provides a number of services to the NEO community. The main service is an impact monitoring system (CLOMON2) of all near-Earth asteroids covering a period until the year 2100. "small", objects with an absolute magnitude fainter than 25 and, even if they are "lost", they are considered too small to result in heavy damage on the ground (though it should be noted that the Chelyabinsk meteor would have been fainter than this). Each object has its own impactor table (IT) which shows many parameters useful to determine the risk assessment. NASA's Sentry System continually scans the MPC catalog of known asteroids, analyzing their orbits for any possible future impacts. Like ESA's NEODyS, it gives a MOID for each near-Earth object, and a list of possible future impacts, along with the probability of each. It uses a slightly different algorithm to NEODyS, and so provides a useful cross-check and corroboration. Currently, no impacts are predicted (the single highest probability impact currently listed is ~7 m asteroid 2010 RF12, which is due to pass Earth in September 2095 with only a 5% predicted chance of impacting). Why predicted asteroid impact probability often goes up, then down. The ellipses in the diagram on the right show the predicted position of an example asteroid at closest Earth approach. At first, with only a few asteroid observations, the error ellipse is very large and includes the Earth. Further observations shrink the error ellipse, but it still includes the Earth. This raises the predicted impact probability, since the Earth now covers a larger fraction of the error region. Finally, yet more observations (often radar observations, or discovery of a previous sighting of the same asteroid on archival images) shrink the ellipse revealing that the Earth is outside the error region, and the impact probability is near zero. For asteroids that are actually on track to hit Earth the predicted probability of impact continues to increase as more observations are made. This very similar pattern makes it difficult to differentiate between asteroids which will be millions of kilometres from Earth and those which will actually hit it. This in turn makes it difficult to decide when to raise an alarm as gaining more certainty takes time, which reduces the time available to react to a predicted impact. However raising the alarm too soon has the danger of causing a false alarm and creating a Boy Who Cried Wolf effect if the asteroid in fact misses Earth. Once an impact has been predicted the potential severity needs to be assessed, and a response plan formed. Depending on the time to impact and the predicted severity this may be as simple as giving a warning to citizens. For example, although unpredicted, the 2013 impact at Chelyabinsk was spotted through the window by teacher Yulia Karbysheva. She thought it prudent to take precautionary measures by ordering her students to stay away from the room's windows and to perform a duck and cover maneuver. The teacher, who remained standing, was seriously lacerated when the blast arrived and window glass severed a tendon in one of her arms and left thigh, but none of her students, whom she ordered to hide under their desks, suffered cuts. If the impact had been predicted and a warning had been given to the entire population, similar simple precautionary actions could have vastly reduced the number of injuries. Children who were not in her class were injured. If a more severe impact is predicted, the response may require evacuation of the area, or an avoidance mission to repel the asteroid. According to expert testimony in the United States Congress in 2013, NASA would require at least five years of preparation before a mission to intercept an asteroid could be launched. Another way to assess the effectiveness of the current system is to look at warning times for asteroids which did not impact Earth, but came reasonably close. Looking at asteroids which came closer than the Moon, the below diagram shows how far in advance of closest approach the asteroids were first detected. Unlike actual asteroid impacts where, by using infrasound sensors, it is possible to assess how many were undetected, there is no ground truth for close approaches. The below chart therefore does not include any statistics for asteroids which were undetected. It can be seen however that the number of detections is increasing as more survey sites come on line (for example ATLAS in 2016 and ZTF in 2018). One final statistic which casts some light on the effectiveness of the current system is the average warning time for an asteroid impact. Based on the few successfully predicted asteroid impacts, the average time between initial detection and impact is currently around 14 hours. Note however that there is some delay between the initial observation of the asteroid, data submission, and the follow up observations and calculations which lead to an impact prediction being made. In addition to the already funded telescopes mentioned above, two separate approaches have been suggested by NASA to improve impact prediction. Both approaches focus on the first step in impact prediction (discovering near-Earth asteroids) as this is the largest weakness in the current system. The first approach uses more powerful ground-based telescopes similar to the LSST. Being ground-based, such telescopes will still only observe part of the sky around Earth. In particular, all ground-based telescopes have a large blind spot for any asteroids coming from the direction of the Sun. In addition, they are affected by weather conditions, airglow and the phase of the Moon. To get around all of these issues, the second approach suggested is the use of space-based telescopes which can observe a much larger region of the sky around Earth. Although they still cannot point directly towards the Sun, they do not have the problem of blue sky to overcome and so can detect asteroids much closer in the sky to the Sun than ground-based telescopes. Unaffected by weather or airglow they can also operate 24 hours per day all year round. Finally, telescopes in space have the advantage of being able to use infrared sensors without the interference of the Earth's atmosphere. These sensors are better for detecting asteroids than optical sensors, and although there are some ground based infrared telescopes such as UKIRT, they are not designed for detecting asteroids. Space-based telescopes are more expensive, however, and tend to have a shorter lifespan. Therefore, Earth-based and space-based technologies complement each other to an extent. Although the majority of the IR spectrum is blocked by Earth's atmosphere, the very useful thermal (long-wavelength infrared) frequency band is not blocked (see gap at 10 μm in the diagram below). This allows for the possibility of ground based thermal imaging surveys designed for detecting near earth asteroids, though none are currently planned. There is a further issue that even telescopes in Earth orbit do not overcome (unless they operate in the thermal infrared spectrum). This is the issue of illumination. Asteroids go through phases similar to the lunar phases. Even though a telescope in orbit may have an unobstructed view of an object that is close in the sky to the Sun, it will still be looking at the dark side of the object. This is because the Sun is shining primarily on the side facing away from the Earth, as is the case with the Moon when it is in a crescent phase. Because of the opposition effect, objects are far less bright in these phases than when fully illuminated, which makes them difficult to detect (see diagram below). Due to the opposition effect over half (53%) of the discoveries of near Earth objects were made in 3.8% of the sky, in a 22.5° cone facing directly away from the Sun, and the vast majority (87%) were made in 15% of the sky, in a 45° cone facing away from the Sun. This problem can be solved by the use of thermal infrared surveys (either ground based or space based). Ordinary telescopes depend on observing light reflected from the Sun, which is why the opposition effect occurs. Telescopes which detect thermal infrared light depend only on the temperature of the object. Its thermal glow can be detected from any angle, and is particularly useful for differentiating asteroids from the background stars which have a different thermal signature. This problem can also be solved without using thermal infrared, by positioning a space telescope away from Earth, closer to the Sun. The telescope can then look back towards Earth from the same direction as the Sun, and any asteroids closer to Earth than the telescope will then be in opposition, and much better illuminated. There is a point between the Earth and Sun where the gravities of the two bodies are perfectly in balance, called the Sun-Earth L1 Lagrange point (SEL1). It is approximately 1 million miles from Earth, about four times as far away as the Moon, and is ideally suited for placing such a space telescope. One problem with this position is Earth glare. Looking outward from SEL1, Earth itself is at full brightness, which prevents a telescope situated there from seeing that area of sky. Fortunately, this is the same area of sky that ground-based telescopes are best at spotting asteroids in, so the two complement each other. Another possible position for a space telescope would be even closer to the Sun, for example in a Venus-like orbit. This would give a wider view of Earth orbit, but at a greater distance. Unlike a telescope at the SEL1 Lagrange point, it would not stay in sync with Earth but would orbit the Sun at a similar rate to Venus. Because of this, it would not often be in a position to provide any warning of asteroids shortly before impact, but it would be in a good position to catalog objects before they are on final approach, especially those which primarily orbit closer to the Sun. One issue with being as close to the Sun as Venus is that the craft may be too warm to use infrared wavelengths. A second issue would be communications. As the telescope will be a long way from Earth for most of the year (and even behind the Sun at some points) communication would often be slow and at times impossible, without expensive improvements to the Deep Space Network. This table summarises which of the various problems encountered by current telescopes are solved by the various different solutions. In 2017 NASA proposed a number of alternative solutions to detect 90% of near-Earth objects of size 140 m or larger over the next few decades, which will also improve detection rates for the smaller objects which impact Earth more often. Several of the proposals use a combination of an improved ground based telescope and a space based telescope positioned at the SEL1 Lagrange point such as NEOCAM. However none of these proposals have yet been funded. As this is a global issue, and noting that to date NASA-sponsored surveys have contributed over 95% of all near earth object discoveries, in 2018 the Trump administration asked NASA to find international partners to help fund the improvements. Below is the list of all near-Earth objects which may have impacted the Earth and which were successfully predicted beforehand. This list would also include any objects identified as having greater than 50% chance of impacting in the future, but no such future impacts is predicted at this time. As asteroid detection ability increases it is expected that prediction will become more successful in the future. ^ Completeness refers to the number of undiscovered asteroids, not the amount of time remaining to achieve completeness. The asteroids remaining to be discovered are the ones which are hardest to find. ^ Because of daylight telescopes cannot see the portion of the sky around the Sun and because the Earth is in the way can only see so far North and South of the latitude that they are positioned at. The time given is the time it takes for a survey to complete coverage of the part of the sky that it can see from where it is located, assuming good weather. ^ The limiting magnitude indicates how bright an object needs to be before the telescope can detect it, larger numbers are better (fainter objects can be detected). ^ Spacewatch is still operational, however in 1998 Catalina Sky Survey (which is also run by the University of Arizona) took over survey duties. Since then Spacewatch has focused on follow up observations. ^ Use of thermal infrared allows objects to be seen at all angles as detection doesn't depend on reflected sunlight. It also allows an accurate size estimate of the object which is important for predicting the severity of an impact. ^ Although many IR wavelengths are blocked by the atmosphere, there is a window from 8 μm to 14 μm that allows detection of IR at useful wavelengths such as 12 μm. A 12 μm sensor was used by WISE to detect asteroids during its space based mission. Although some ground based IR surveys exist which can detect 12 μm (such as UKIRT Infrared Deep Sky Survey), none are designed to detect moving objects such as asteroids. ^ an object with the temporary designation A106fgF was discovered by the ATLAS survey and only has an observation arc of 39 minutes. Using the observation arc, it was only possible to estimate a 9% chance of impact between the South Atlantic, southern Africa, the Indian ocean, Indonesia, or the Pacific ocean. Whether the asteroid did impact Earth or not remains uncertain due to its small size. ^ 2018 LA was estimated to have an 82% chance of impacting Earth somewhere between the central Pacific ocean and Africa (Impact path). Several reports from South Africa and Botswana confirmed that it did indeed impact in South-central Africa and additional observations that came in after the impact post-predicted a consistent impact location. ^ a b c "Federal Government Releases National Near-Earth Object Preparedness Plan". Centre for NEO Studies. Interagency Working Group for Detecting and Mitigating the Impact of Earth-Bound Near-Earth Objects. Retrieved 24 August 2018. ^ a b Morrison, D., 25 January 1992, The Spaceguard Survey: Report of the NASA International Near-Earth-Object Detection Workshop Archived October 13, 2016, at the Wayback Machine, NASA, Washington, D.C.
^ Harper, Paul (28 April 2018). "Earth will be hit by asteroid with 100% CERTAINTY – space experts warn - EXPERTS have warned it is "100pc certain" Earth will be devastated by an asteroid as millions are hurling towards the planet undetected". Daily Star. Retrieved 24 November 2018. ^ Homer, Aaron (28 April 2018). "Earth Will Be Hit By An Asteroid With 100 Percent Certainty, Says Space-Watching Group B612 - The group of scientists and former astronauts is devoted to defending the planet from a space apocalypse". Inquisitr. Retrieved 24 November 2018. ^ Stanley-Becker, Isaac (15 October 2018). "Stephen Hawking feared race of 'superhumans' able to manipulate their own DNA". The Washington Post. Retrieved 24 November 2018. ^ Haldevang, Max de (14 October 2018). "Stephen Hawking left us bold predictions on AI, superhumans, and aliens". Quartz. Retrieved 24 November 2018. ^ Bogdan, Dennis (18 June 2018). "Comment - Better Way To Avoid Devastating Asteroids Needed?". The New York Times. Retrieved 24 November 2018. ^ Staff (21 June 2018). "National Near-Earth Object Preparedness Strategy Action Plan" (PDF). White House. Retrieved 24 November 2018. ^ Mandelbaum, Ryan F. (21 June 2018). "America Isn't Ready to Handle a Catastrophic Asteroid Impact, New Report Warns". Gizmodo. Retrieved 24 November 2018. ^ Myhrvold, Nathan (22 May 2018). "An empirical examination of WISE/NEOWISE asteroid analysis and results". Icarus. 314: 64–97. Bibcode:2018Icar..314...64M. doi:10.1016/j.icarus.2018.05.004. Retrieved 24 November 2018. ^ Chang, Kenneth (14 June 2018). "Asteroids and Adversaries: Challenging What NASA Knows About Space Rocks - Two years ago, NASA dismissed and mocked an amateur's criticisms of its asteroids database. Now Nathan Myhrvold is back, and his papers have passed peer review". The New York Times. Retrieved 24 November 2018. ^ Chang, Kenneth (14 June 2018). "Asteroids and Adversaries: Challenging What NASA Knows About Space Rocks - Relevant Comments". The New York Times. Retrieved 24 November 2018. ^ a b c d e f g h i j "Update to Determine the Feasibility of Enhancing the Search and Characterization of NEOs" (PDF). Near-Earth Object Science Definition Team Report 2017. NASA. Retrieved 7 July 2018. ^ Granvik, Mikael; Morbidelli, Alessandro; Jedicke, Robert; Bolin, Bryce; Bottke, William F.; Beshore, Edward; Vokrouhlický, David; Nesvorný, David; Michel, Patrick (25 April 2018). "Debiased orbit and absolute-magnitude distributions for near-Earth objects". Icarus. Elsevier / Science Direct. 312: 181–207. Retrieved 14 December 2018. ^ a b David, Rich (22 June 2018). "The "Threat" of Asteroid Impacts - Breaking Down the Comprehensive Chart by the US Government". Asteroid Analytics. Retrieved 14 December 2018. ^ a b Makoni, Munyaradzi (4 September 2018). "NASA's next-generation asteroid telescope set for South Africa". Physics World. IOP Publishing. Retrieved 10 December 2018. ^ a b Terán, José; Hill, Derek; Ortega Gutiérrez, Alan; Lindh, Cory (2018-07-06). "Design and construction of the SST Australia Observatory in a cyclonic region". SPIE. The international society for optics and photonics. 10700: 1070007. doi:10.1117/12.2314722.short (inactive 2018-11-05). Retrieved 20 October 2018. ^ a b Watson, Traci (2018-08-14). "Project that spots city-killing asteroids expands to Southern Hemisphere". nature international journal of science. Springer Nature Limited. Retrieved 17 October 2018. ^ a b c "Residuals". Minor Planet Center. International Astronomical Uniion. Retrieved 22 October 2018. ^ a b c d "Spacewatch". UA Lunar & Planetary Lab. University of Arizona. Retrieved 7 December 2018. ^ Heinze, Aren (Ari). "The Last Alert: A New Battle Front in Asteroid Defense". CSEG Recorder. Canadian Society of Exploration Geophysicists. Retrieved 17 October 2018. ^ "ATLAS specifications". Retrieved 9 December 2018. ^ UA Lunar & Planetary Laboratory. "Catalina Sky Survey Telescopes". Catalina Sky Survey. The University of Arizona. Retrieved 17 October 2018. ^ LSST Project Office. "LSST PROJECT SUMMARY". Large Synoptic Survey Telescope. Retrieved 17 October 2018. ^ a b "Flyeye Telescope". ESA. European Space Agency. Retrieved 10 December 2018. ^ "ESA's bug-eyed telescope to spot risky asteroids". ESA Space Situational Awareness. European Space Agency. Retrieved 10 December 2018. ^ Hugo, Kristin. "EUROPEAN SPACE AGENCY'S 'FLYEYE' TELESCOPE COULD SPOT ASTEROIDS BEFORE THEY DESTROY LIFE ON EARTH". Newsweek Tech & Science. Newsweek. Retrieved 10 December 2018. ^ Clavin, Whitney (December 14, 2009). "NASA's WISE Eye on the Universe Begins All-Sky Survey Mission". NASA Jet Propulsion Laboratory. Retrieved December 26, 2009. ^ "Wide-field Infrared Survey Explorer". Astro.ucla.edu. Retrieved August 24, 2013. ^ Reuters (August 22, 2013). "NASA space telescope rebooted as asteroid hunter". CBC News. Retrieved August 22, 2013. ^ "NEOCam Instrument". Jet Propulsion Laboratory. NASA. Retrieved 23 October 2018. ^ Michele Bannister [@astrokiwi] (30 Jun 2014). "Twitter" (Tweet). Retrieved 1 May 2016 – via Twitter. ^ "Pan-STARRS". UoH Institute for Astronomy. University of Hawaii. Retrieved 17 October 2018. ^ University of Hawaii at Manoa's Institute for Astronomy (18 February 2013). "ATLAS: The Asteroid Terrestrial-impact Last Alert System". Astronomy Magazine. Retrieved 2018-10-17. ^ Pike, John (2010). "Space Surveillance Telescope" (Basic overview). GlobalSecurity.org. Retrieved 2010-05-20. ^ Ruprecht, Jessica D; Ushomirsky, Greg; Woods, Deborah F; Viggh, Herbert E M; Varey, Jacob; Cornell, Mark E; Stokes, Grant. "Asteroid Detection Results Using the Space Surveillance Telescope" (PDF). Defense Technical Information Center. DTIC. Retrieved 20 October 2018. ^ Bellm, Eric; Kulkarni, Shrinivas (2017-03-02). "The unblinking eye on the sky". Nature Astronomy. 1 (3): 0071. arXiv:1705.10052. Bibcode:2017NatAs...1E..71B. doi:10.1038/s41550-017-0071. ISSN 2397-3366. ^ Smith, Roger M.; Dekany, Richard G.; Bebek, Christopher; Bellm, Eric; Bui, Khanh; Cromer, John; Gardner, Paul; Hoff, Matthew; Kaye, Stephen (2014-07-14). "The Zwicky transient facility observing system" (PDF). Ground-based and Airborne Instrumentation for Astronomy V. 9147: 914779. doi:10.1117/12.2070014. ^ Cao, Yi; Nugent, Peter E.; Kasliwal, Mansi M. (2016). "Intermediate Palomar Transient Factory: Realtime Image Subtraction Pipeline". Publications of the Astronomical Society of the Pacific. 128 (969): 114502. arXiv:1608.01006. Bibcode:2016PASP..128k4502C. doi:10.1088/1538-3873/128/969/114502. ^ Birtwhistle, Peter. "Great Shefford Location and situation". Great Shefford Observatory. Retrieved 24 October 2018. ^ a b "NEOCam Infrared". Jet Propulsion Laboratory. NASA. Retrieved 30 October 2018. ^ "Discovery of a Satellite Around a Near-Earth Asteroid". European Southern Observatory. 22 July 1997. Retrieved 30 October 2018. ^ a b "NEO Earth Close Approach data". NASA JPL. NASA. Retrieved 7 July 2018. ^ "NEO Basics - NEO Groups". Center for Near Earth Object Studies. NASA JPL. Retrieved 25 October 2018. ^ "Sentry: Earth Impact Monitoring Introduction". Center for Near Earth Object Studies. NASA JPL. Retrieved 25 October 2018. ^ "Near Earth Objects - Dynamic Site". NEODyS-2. European Space Agency. Retrieved 25 October 2018. ^ "NEODyS-2 Risk List". NEODyS-2. European Space Agency. Retrieved 25 October 2018. ^ a b c "How NASA hunts the asteroids that could smash into Earth". Vox.com. Vox Media Inc. 2017-06-30. Retrieved 4 September 2018. ^ Kramer, Andrew E. (17 February 2013). "After Assault From the Heavens, Russians Search for Clues and Count Blessings". New York Times. Archived from the original on 17 February 2013. ^ "Челябинская учительница спасла при падении метеорита более 40 детей". Интерфакс-Украина (in Russian). Retrieved 2018-09-28. ^ Bidder, Benjamin (15 February 2013). "Meteoriten-Hagel in Russland: "Ein Knall, Splittern von Glas"" [Meteorite hail in Russia: "A blast, splinters of glass"]. Der Spiegel (in German). Archived from the original on 18 February 2013. ^ U.S.Congress (19 March 2013). "Threats From Space: a Review of U.S. Government Efforts to Track and mitigate Asteroids and Meteors (Part I and Part II) – Hearing Before the Committee on Science, Space, and Technology House of Representatives One Hundred Thirteenth Congress First Session" (PDF). United States Congress. p. 147. Retrieved 24 November 2018. ^ "JPL - Fireball and bolide reports". Jet Propulsion Laboratory. NASA. Retrieved 1 Feb 2019. ^ "LSST Project Schedule". Retrieved 24 August 2018. ^ UKIDSS Home Page. Retrieved April 30, 2007. ^ "Impact Risk Data". Sentry: Earth Impact Monitoring. Jet Propulsion Lab. Retrieved 7 July 2018. ^ Jenniskens, P.; et al. (2009). "The impact and recovery of asteroid 2008 TC3". Nature. 458 (7237): 485–488. Bibcode:2009Natur.458..485J. doi:10.1038/nature07920. PMID 19325630. ^ "Tiny Asteroid Discovered Saturday Disintegrates Hours Later Over Southern Africa". NASA/JPL. Jet Propulsion Laboratory. Retrieved 4 June 2018.